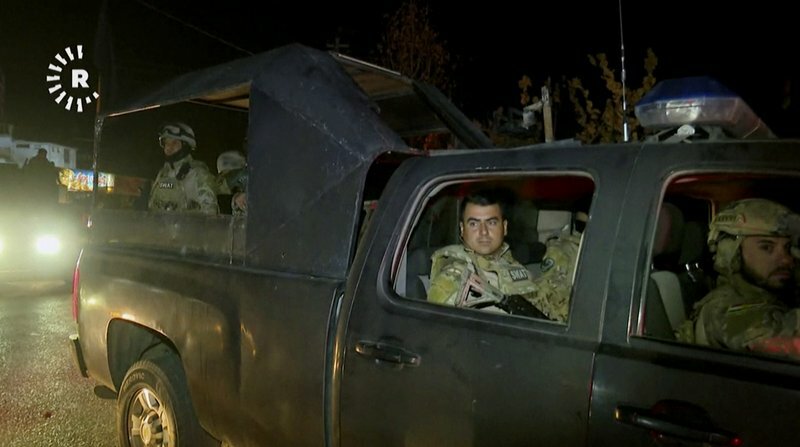 BAGHDAD (AP) — Iraqi federal forces entered disputed territory held by Kurds early Monday, seeking to end a nearly month-old political fight over areas taken under control by Kurdish militias three years ago to defend the oil city of Kirkuk against the Islamic State group. The Iraqi army and federal anti-terrorist and police units rolled into parts of the countryside outside the city without facing resistance from Kurdish peshmerga forces, Al-Iraqiya state TV said. However, some residents of the city and an Iraqi militia commander reported shelling. Prime Minister Haidar al-Abadi’s office said in a statement carried on Al-Iraqiya that Iraq’s leader ordered federal forces to “impose security in the city in cooperation with the inhabitants and the peshmerga,” indicating he was willing to share administration of the city with the Kurdish autonomous region that neighbors Kirkuk province. The move came three weeks after Kurds voted for independence in a controversial but symbolic referendum that Baghdad has so refused to acknowledge. It says the vote organized by the country’s regional Kurdish authority was unconstitutional. A commander of the local Kurdish police force said his forces remained in control of the province’s disputed oil wells. “There’s been no agreement to hand over the wells until now. As for the future, I don’t know,” said Bahja Ahmad Amin. Kurdish forces deployed into the now disputed areas after Iraqi federal defenses crumbled during an advance by Islamic State fighters in 2014. Baghdad has insisted the Kurds return control of the areas ever since. Inside Kirkuk city, which is home to more than 1 million people, residents shuttered themselves in homes and reported hearing sporadic booms they said sounded like shelling and rocket fire. Iraq’s state-sanctioned Popular Mobilization Militias were ordered to stay out of the city, according to Abadi’s office, and instead keep positions in the countryside. They are viewed with deep suspicion by Kurdish residents, who see them as beholden to Iran rather than Iraq’s central government. The predominantly Shiite militias are sponsored and guided by Tehran. Ercuman Turkman, a PMF militia commander, said shortly before forces began moving in that he expected orders to move on to Kirkuk’s oil wells, its airport and the nearby K-1 military base, but not the city. Haytham Hashem, another PMF commander, reported shelling on his position in Toz Khormato, 10 kilometers (6 miles) from the edge of Kirkuk city. Baghdad has been turning the screws on the Kurdish region since the September referendum, pushing Kurd leaders to disavow the vote and accept shared administration over Kirkuk. Iraq’s government barred international flights to and from the region and asked neighboring Turkey and Iran to close their borders. Iran closed its three official crossings with the Kurdish region Sunday, Kurdish media reported. It also froze currency transfers to four banks operating in the Kurdish region. Abadi has demanded shared administration over Kirkuk. His Cabinet said Sunday that fighters from Turkey’s Kurdish insurgency, the PKK, were beginning to appear in Kirkuk, and declared that would be tantamount to an act of war. Associated Press stringer Emad Matti in Kirkuk contributed to this report. 0 Response to " Iraqi forces enter territory disputed with Kurds"